Not too many guys want to admit that they use Code Readers in CW contest, but I think that quite a few do. Here is how to setup the PK-232 and Writelog. It is a lot easier to use WF1B to do CW than Writelog. If you have WF1B, Start a new worksheet and select "AEA CMD" for the TNC. Once the main screen comes up, use "ALT-T" to talk to the TNC. You want to type in the command "MO" for morse code. You should see the light on the TNC Change from Baudot to CW. ALT-T to get out of talk to TNC mode. After that, you can operate WF1B just like rtty except that it is decoding and sending CW. To use Writelog is a little more work. The author that wrote it, Wayne W5XD, never intended for it to receive CW. So you have to "Fool it". This is the most important thing to remember, You cannot send and receive CW using the PK-232 within Writelog. When you setup the PK-232 to use the PK-232 to send CW, the program will NOT allow it to be used for receiving CW. Remember this as I tell you how to set it up. 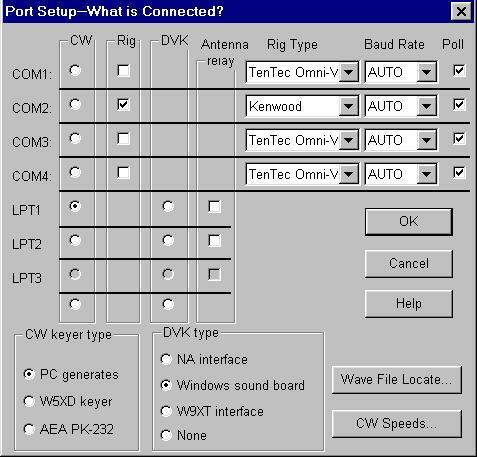 You see I have LPT-1 selected, CW Keyer type as "PC generates". Do not have AEA PK-232 Selected. At this point you should be able to SEND CW using the memories. If not, figure out what is wrong as you can’t go any farther. The next step is to fool the Writelog program in thinking you are opening a RTTY receive window and setting it to CW instead of baudot. You should have the RTTY window already configured to PK-232 and what port you are going to use. You need to put this one (1) command in your Writelog.INI file. TncInit1=MO - This will initialize the TNC (PK-232) on startup to Morse code (MO) instead of rtty. It should be in the Rttyrite portion of the Writelog.ini file. See below for example. You can have up to four (4) of these TncInit1..4 to set other commands. You really only need the one. If you want to return to RTTY, just "Comment out" the TncInit1 command line by putting a ";" in front of it. An example of this is ";TncInit2" below in the example. Now that is all you need – HI HI. The only thing that did not work for me is the ALT-K to go into the Keyboard mode. When I tried, it instead tried to bring up the keyboard mode of the PK-232 instead of the CW keyboard. So you have to make sure you have everything you need to say in the memories. Speaking of memories, remember to use Vox or Breaking for keying, you may not have PTT in this setup. N1RCT All Things RTTY . I hope this helps and I hope you were able to read it all.